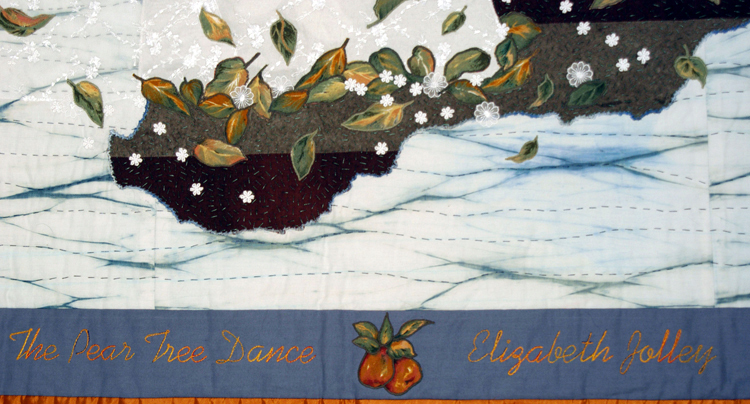 For this week’s post we found an object from the Elizabeth Jolley Research Collection – a beautifully designed quilt inspired by the writing of Elizabeth Jolley, with the title The Pear Tree Dance. 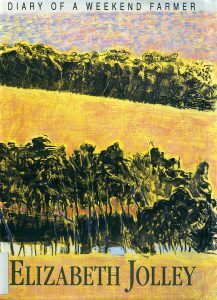 In 1970 the Jolley family purchased five acres (two hectares) of land with a weatherboard cottage in the Darling Range near Wooroloo. The property, which came to be known as The Orchard, was purchased before Jolley’s novels had been published, and became the locale for some of her writing. The Diary of a Weekend Farmer (1993) records in diary extracts, short pieces and verse, the early years of the family’s weekend farming. Much of Jolley’s writing borrowed from her real life experiences, and several scenes and characters appearing in The Diary of a Weekend Farmer were also used in her novels and shorter works. Jolley wrote two works in the early 1970s with the title The Pear Tree Dance; the poem on page 51 of The Diary of a Weekend Farmer, and a longer prose piece (Woman in a lampshade) which was later revised for the ending of The Newspaper of Claremont Street. It was the scene in the final paragraphs of The Newspaper of Claremont Street that inspired Lesley Fitzpatrick in the design of her quilt The Pear Tree Dance. The Pear Tree quilt by Lesley Fitzpatrick. The quilt was created for a project commemorating the Centenary of Women’s Suffrage in WA in 1999. Quilts produced for the project were shown in the exhibition Material Women 1999: Quilts that tell stories curated by Katie Hill and Margaret Ross, from the School of Occupational Therapy at Curtin. The quilts focused on celebrating the lives and contribution of more than 50 West Australian women (and one man) and featured several women associated with Curtin and WAIT, including Erica Underwood, Margaret Ross, Carolyn Webster and Elizabeth Jolley. CUL0004/10/16 The Pear Tree Dance quilt, and accompanying exhibition catalogue, Material women ’99: Quilts that tell stories. Curtin University of Technology. Dibble, Brian, Doing life: a biography of Elizabeth Jolley (2008). 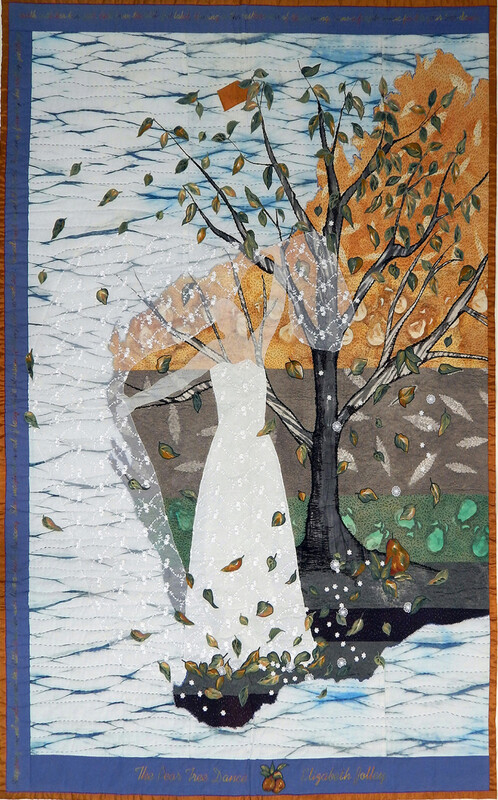 With sincere thanks to Lesley Fitzpatrick for permission to reproduce the images of The Pear Tree Dance quilt that appear on this page. Previous Previous post: 47. The Camp, by Vance Palmer, 1920 and letters from Katharine Susannah Prichard. Next Next post: 49. From the Australian Front, Xmas 1917.